Enjoy inner peace and transcendent relaxation as the Arcangelos Chamber Ensemble performs timeless gems. 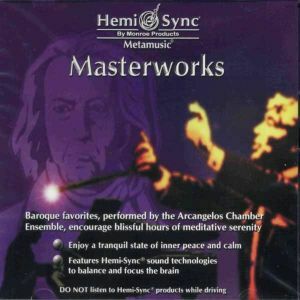 Use Masterworks for expanding awareness through musical imagery and self-exploration; for deeper, more profound meditation; or simply for musical enjoyment. Produced by Richard Lawrence and Joshua Leeds. Relaxation music, Altered state of consciousness, Deep meditation.